Pinchers are defects which occurs during rolling the billet or block to the wire or steel bar. Rolling fins, which were pressed in again during the subsequently rolling process, are a cause for example. Strong grooves at the semi finished products (billet) also can lead to pinchers, if they are pressed together during rolling to the profile. 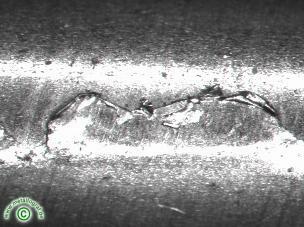 The defect can occur locally or about the complete rod wire length. Looked about the extent, the defect can be existing on one side or also transposed by 180° . In the case represented here the material still has been drawn easily after rolling and was then sharpened on finished size. For this reason the existing remains of the pinchers are very thinly.